The PolyScience Sous Vide Professional SVC-AC1B is a top of the line precision immersion circulator. It's designed to be used in restaurants or laboratories and is complete overkill even for the most ambitious of home chefs. If you are looking for the quality of PolyScience but designed for home use look at the PolyScience Creative Series Sous Vide instead. $799.95 Current Price - YOU SAVE $119.99. This model was massive compared to the other 33 Sous Vide models we looked at. It was 14" tall 4" wide and weighed almost 10 pounds. That's a lot to have to deal with just to make dinner for your family. It's extremely high quality with an impact resistant polycarbonate housing. It puts out 1100 Watts of power and has a flow rate of 3.1 GPM putting it near the very top for all the models we reviewed. The controls are well laid out and easy to read, which is something we noticed and appreciated after reviewing less expensive and needlessly complicated models. This model puts out 1100 watts of power, which is higher than the average for the models we reviewed. It has a flow rate of 3.1 GPM, which is higher than 2.0 GPM average for the models we reviewed. 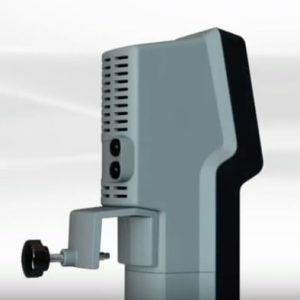 This high power and high flow rate on this model means you will have to be much more vigilant about the water level on extended time cooking projects. The high power and flow rate of this model means it will reach your set temperature a lot more quickly than most models. The quality and price of this model take this model out of reach for most people, and that's OK because it's honestly more machine than almost everyone needs. The PolyScience Creative Series Sous Vide is a consumer level model with commercial grade quality for people need a high end product. 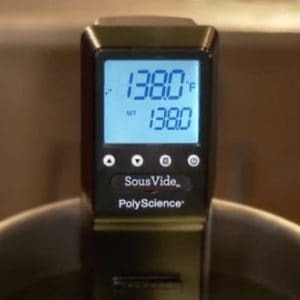 The PolyScience Sous Vide Professional SVC-AC1B is a commercial grade product that's best suited for restaurants and laboratories, this is not a consumer level product.